One site I'm committed to spending more time on in the new year is the virtual pinboard Pinterest. It's easy to use, powerfully visual, populated with cause marketing-loving women and growing like crazy. 4,000 percent in six months! The heavy presence of women 25-44 on Pinterest is what distinguishes it from other new social media platforms, which are generally populated by men 18-24. Here's a site that already has the audience everyone wants: women and moms who make most of the household buying decisions. I think most people jump on Pinterest for the same reason I did. They want a place to easily organize images and display them all in one place. No more looking at pictures one at a time. No more digging through tabs to find the album you're looking for. It's all right there. When I needed a place where I could display pictures of people who had snapped a picture of themselves with my book Cause Marketing for Dummies. Pinterest gave me an easy place to pin, organize and see them all at once. I also created a board for cause marketing promotions I liked. I plan to break out this board further with boards for point-of-sale, purchase-triggered, action triggered, message promotion, etc. to make even more sense of the images I'm pinning. Most of the pinning happening right now on Pinterest is around art, home decor, style and other things women love. Brands are also getting involved. Mashable is on Pinterest, as is Peapod Delivers. Lands' End just finished a Pinterest contest that encouraged users to create their own holiday pinboard around their favorite canvas items. Creators of stylish pin boards received gift certificates for $250. Pinterest users are also pinning about brands, such as Starbucks. Are you doubting that Pinterest will break the list of top social networking sites and will soon be forgotten? Think again. It's already broken the top ten list right behind Yelp with nearly 32 million visitors in November. 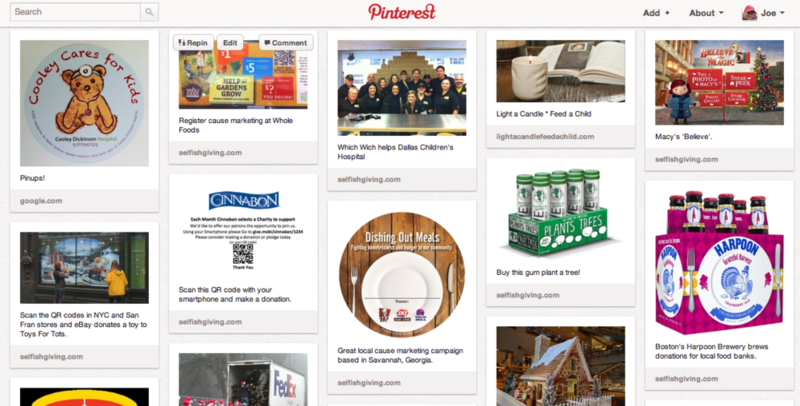 But is your nonprofit right for Pinterest? Ask yourself these questions. Do you have an interesting or compelling story to tell with images? Every cause does, but believing you do is half the battle. Pinterest is a natural site for museums, historical sites and cultural institutions. Maybe your nonprofit helps needy kids and you have a pinboard called "happy moments" to capture all the great things you're doing for and with kids. Is your cause considered hip, trendy, or do you just want to be? Pinterest users are looking for cool, trendy and hip things. I think organizations such as Goodwill and Shelter Scotland could pin fashionable used clothes available in their stores. Conservation International could post images of the beautiful and endangered frogs they are trying to save. Are you engaged on other social media platforms? Despite my enthusiasm for Pinterest, it's not a standalone platform. I wouldn't start with it unless I already had an active blog, Facebook and Twitter. It's win-win. You'll gain traffic from visitors to Pinterest but your social media platforms can drive traffic to it as well. Are you looking to reap the rewards of local SEO? I've talked about the benefits of your nonprofit being easily found online. Pinterest can give your SEO a big boost because the links posted there - every image links to a real web page - are being posted by REAL PEOPLE and not marketers and spammers trying to game the system. This won't last forever so get busy now! Be useful. Pinterest users are looking for ideas and inspiration. Speak to that muse. Just don't pin a picture of the new lobby area of your school. Highlight an architectural detail that makes it interesting, unique and inspiring. Create categories that reflect what users are looking for. If you run the Paul Revere House and want to post pictures of the furnishings and silver work call it "Early American Decor" or "Silver Teapots." Give the job to someone who has an eye for images. Not everyone has a good eye for pictures - that includes me! Just look at some of the images on Pinterest. They're beautiful. Yours should be too. Learn from these 15 Pinterest superusers. I found this article on the habits of 15 superusers very helpful on what Pinterest is for and not and how to use it wisely. This post made me laugh as there is only one guy on the list. Yep, Pinterest is for the ladies. Don't just pin, repin. Pinterest is just like any other social network. It's not all about you. Search through Pinterest and find images that you can repin on your boards. As with most social platforms, this is where the magic happens! Let your supporters pin for you. Add "pin it" buttons to your blog or web site so your visitors and supporters can create their own pin boards that highlight your cause. Fundraising ideas for Pinterest are already popping up. Check out this one from the folks at Help Attack!